A couple of weeks ago I was in Cambridge giving a talk at a nice cosmology meeting housed in the splendid Centre for Mathematical Sciences. How the other half lives. The building is not only palatial, it is also very well designed for informal interactions and discussions. When I was a student at Cambridge this building didn’t exist and the Department of Applied Mathematics and Theoretical Physics was housed in rather ramshackle but characterful buildings in Silver Street, right in the city centre. I don’t know what department is there now. I gave a talk with the title “Fishing for Elephants in the CMB”. I always think it’s a good idea not to give too much away in the title, although perhaps in this case I went a bit too far. Quite apart from the mixed metaphor, it doesn’t really give any clue at all as to what I was talking about. Mind you, I’m not sure at the end of the talk the audience was any the wiser either. 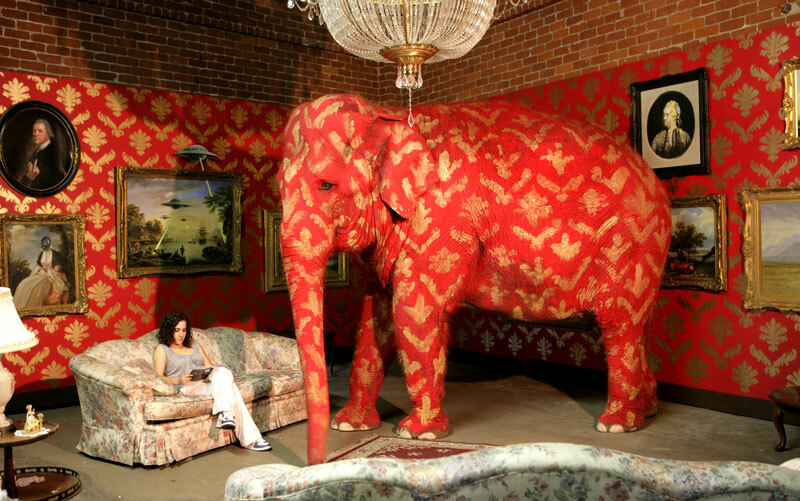 The idea for the title came from the phrase “There’s an Elephant in the Room”, a curious expression that even has its own wikipedia entry, as well as being the title of the picture shown here made by the artist Banksy. It refers to something that is large and obvious, but is being ignored for some reason, usually because it is considered impolite to draw attention to it. My talk of course wasn’t about real elephants but the possibility that there may be a metaphorical one in the field of cosmology, something that is consciously ignored by most of the community. In yesterday’s post, I referred to the importance of the cosmic microwave background in establishing the so-called “concordance model” of cosmology. But as well as providing compelling evidence in support of this theory, the CMB has also thrown up a few bits of evidence that are quite difficult to reconcile with the standard description of the Universe. Perhaps the most famous of these anomalies is the so-called “Axis of Evil“, which is an unexplained alignment of features in the pattern of temperature fluctuations observed across the sky by the Wilkinson Microwave Anisotropy Probe (WMAP) satellite. In the concordance picture, the fluctuations are basically random so there shouldn’t be coherent alignments like this. But the Axle of Elvis isn’t the only curiosity in the cosmology shop. There is also a significant asymmetry between North and South on the sky (with respect to the ecliptic plane) when the two celestial hemispheres should be statistically indistinguishable if the standard model is correct. There also exists a peculiar cold spot. Of course a fluctuating temperature pattern must contain places colder than average and places hotter than average. However, the standard model assumes these are drawn from a Gaussian (or “normal“) distribution, in which large fluctuations are extremely rare. The cold spot we see in the WMAP is colder than the coldest cold spot expected if the standard model is right, with odds of greater than 1000:1 against. And there’s more. Statistical measures of the fluctuation pattern, such as the correlation function, pixel variance and quadupole moment, all give results for the real sky that are discordant with theory, although admittedly some are more significant than others. There are others too but I have no time to go into them, except to say that they may be related to the ones I’ve already mentioned, or at least share a common cause. There may indeed be some truth to this, but serious attempts have been made to assess the statistical significance of the various results and my personal reaction is that, while coincidences do happen, it is unwise to dismiss 1000:1 results as mere flukes. On the other hand, these assessments are difficult and the significance may have been miscalculated. More likely is the presence of some slight unidentified systematic artefact in the data. Not being an experimentalist it’s unfair to cast doubts on the brilliant work of the WMAP team, but one should keep an open mind about this possibility. But as a theorist I have to admit that the most exciting possibility is that, lurking out there somewhere, are clues to a radical departure from orthodox theory. Many suggestions have been made, and no doubt most of them will be shown to be wrong. But the most dramatic thing that can happen in science is when the only game in town is “none of the above” and we are forced to think outside the box altogether. I’m certainly not going to argue that we need to ditch the standard model or that cosmologists should all become obsessed with these tantalising conundrums. But in focussing exclusively on questions related to the standard model and its parameters, we may be throwing away a great deal of potentially exciting information. Every now and again, it’s worth checking your waste basket in case there’s something in it that you really shouldn’t have binned. I realise that there are probably too many mixed metaphors in this piece. They’re a habit of mine and when you get to my age it’s difficult to change. After all, you can’t teach an old leopard to change its spots in midstream. This entry was posted on September 26, 2008 at 2:03 pm and is filed under Cosmic Anomalies, The Universe and Stuff with tags Cosmology, Science. You can follow any responses to this entry through the RSS 2.0 feed. You can leave a response, or trackback from your own site. Hello, nice of you to mention “radical departure from orthodox theory.” Physicists always enjoy citations of their work.